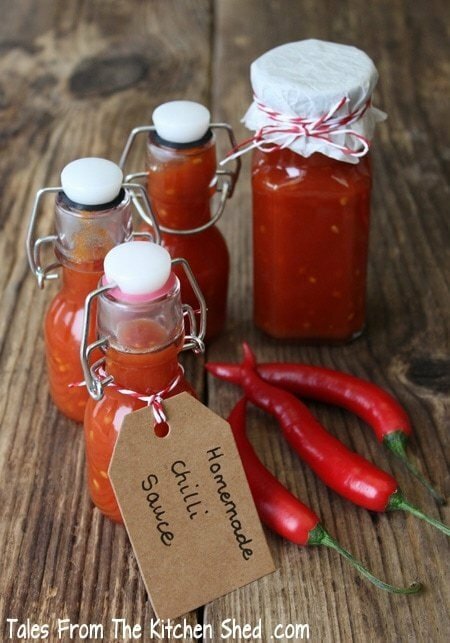 Homemade Chilli Sauce makes a great edible gift, perfect for all your chilli loving friends. Easy to make & tastes so much better than shop bought. Our family loves chillies and when we moved to France I started to grow them, experimenting each year with different varieties of chillies. We’ve had a bumper chilli crop this year which means I’ve already made a batch of my Scotch Bonnet Sauce for our chilli head friends and OH, plenty of my prize winning Sweet Chilli Jam and I’ve even got a bag full of chillies in the freezer. 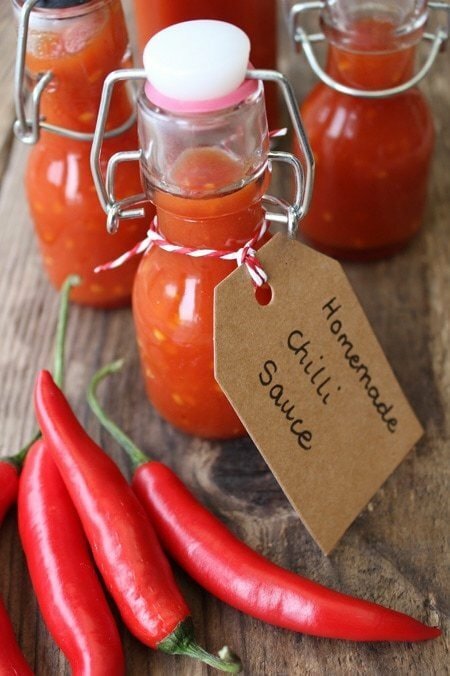 For my Homemade Chilli Sauce I’ve used Cayenne chillies to give a medium hot heat – I’ve left the seeds in but if you prefer less heat you can remove the seeds. The Cayennes give a fiery heat without being overpowering although you can use a different variety of chilli if you prefer – a good tip is to taste the chilli before using to check how hot it is. Being made from fresh chillies, the sauce has a bright fresh colour and flavour, something you just don’t get with shop bought. 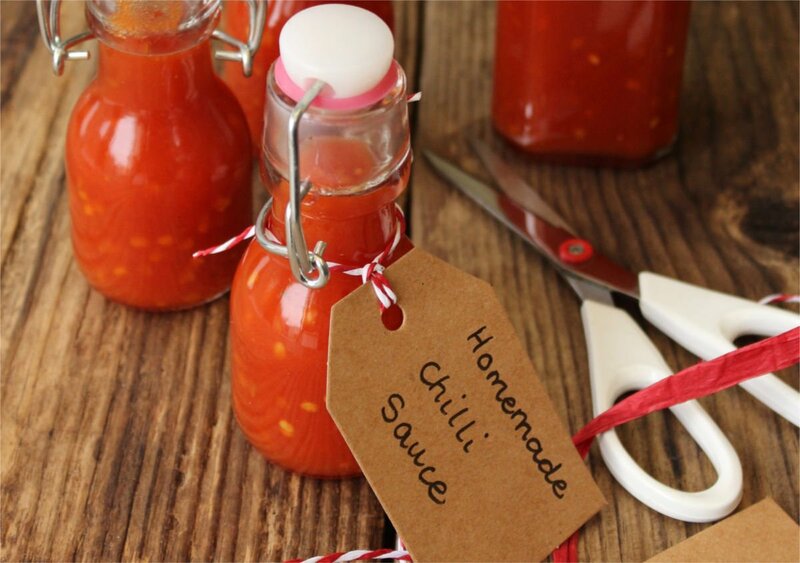 My Homemade Chilli Sauce is the final addition to our Christmas Hampers so next stage is Christmas bakes … I so love this time of year. I’ve bottled my sauce in cute little bottles which I bought from Tiger Stores in Leicester. Definitely worth checking out Tiger as they have lots of jars, bottles and all sorts of labels, ribbons and kitchen bits and pieces. I know Tiger have stores throughout the UK but being a Danish brand I suspect you’ll find them elsewhere in Europe – not sure about worldwide ? 4 to 6 sterilised bottles or jars depending on the size of bottle you use. Skin, deseed and roughly chop your tomatoes. Roughly slice your chillies – deseed them if you want less heat in the sauce. Add the tomatoes and chillies to a large saucepan along with half the cider vinegar. Place on a medium heat and bring to a simmer. Simmer for 30 minutes with a lid on until soft. Remove from the heat and whizz together – I use a stick/hand blender. Be careful, the mixture is hot and you don’t want any chilli in your eye ! Add the sugar and salt and place back on the heat, give it a good stir and add the spice bag. Leave to simmer uncovered for 30 minutes. Add the remaining vinegar and simmer for between 30 minutes to one hour until the mixture has reduced down to a nice thick sauce. Pour into hot sterilised bottles or jars using a funnel. Will keep for up to 12 months in a cool, dark place. Use like Tabasco, it will add a definite kick to any dish – works really well on a pizza ! Besides livening up chicken or other meats, if I’ve run out of fresh chillies I use a tablespoon of Homemade Chilli Sauce instead of a chilli. Tastes great in fajitas and adds a zing to a salsa. It’s a larder staple in our house. 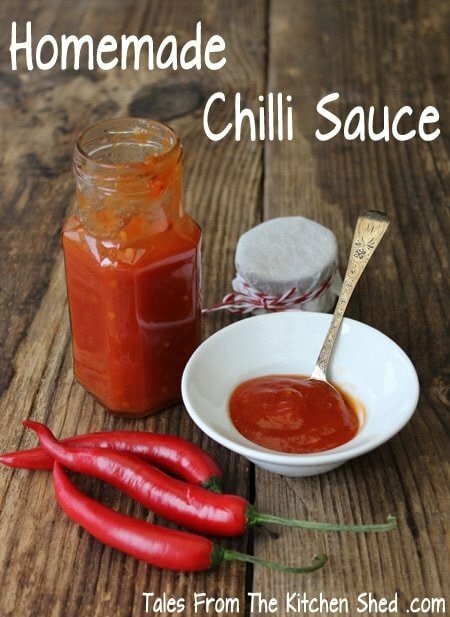 I’m entering Homemade Chilli Sauce into the Credit Crunch Munch challenge created by Camilla from Fab Food 4 All & Helen over at Fuss Free Flavours & hosted this month by Helen. Made this for friends and family, glad I kept some myself though because it is amazing and my father in law has been passing it around his brothers and sisters for them to try. Think i’ll have to double or treble the batch next time. 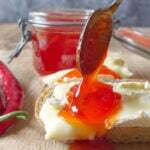 Thanks for trying my recipe Katie, it’s great to our homemade chilli sauce has gone down so well with your family. 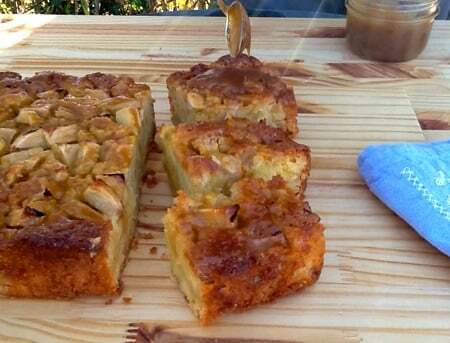 The recipe is really easy to scale up and saves a lot of time. looks great. Is the cider vinegar, apple cider vinegar?? Thanks for popping by Courtney, it is apple cider vinegar. Pingback: Homemade Chicken Kebabs : Perfect for the BBQ or under the grill! Sounds great! My husband would love this. This looks great. I often make something plain for the boys and then add a spoon of chilli oil to my portion. How long does it keep for? Thanks Claire. That’s a great way of spicing up your food. The chilli sauce will keep for up to 12 months, although I’ve found a bottle on the top shelf of my pantry that was almost 2 years old & it was still good to use. It tends to lose the bright red colour after a few months but still tastes equally as good. Thanks for popping by. Hi Sarah! So lovely to see you at #FestiveFoodFriday again. This sounds delicious. I made lots of chutney to give this year but this looks like such a special gift to make for giving! Hope I have some time in the coming week to try it. 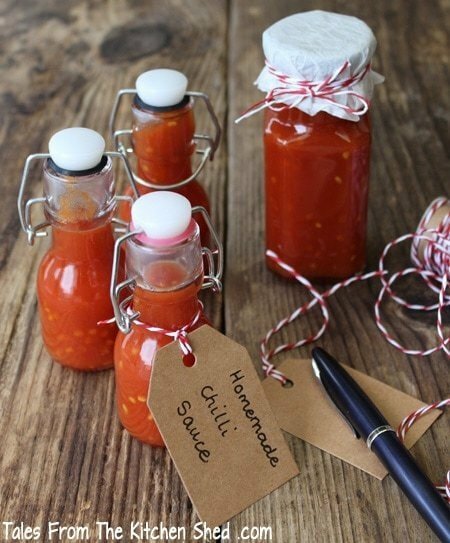 Have to make this when I can get fresh hot peppers and good tomatoes (not till next year now), we love hot sauce and this looks so much better than store bought. I’ve pinned the recipe for 2016. Thank you for bringing it to FF. The little jars are wonderful. Perfect Christmas gifts. Welcome to FF Sarah! What a fabulous gift from the kitchen! I have a son who would love receiving this hot sauce. I experimented with hot sauce making this summer and must say it was really easy and delicious. I tried to find ripe peppers this week in fact to cook up another batch and they were all gone. Love the bottles and tags?